Most people like having a partner that tends to be happy, with a great sense of humor. The reason is that they take things in their stride and generally have a positive attitude. And when you have a sense of humor, you are highly attractive and that is because you seem to be an upbeat individual which talks a lot about your happy outlook about life. Additionally, a sense of humor can override a lot of flaws and your personal weaknesses, because you try to highlight the best in you or take your weaknesses in your stride. 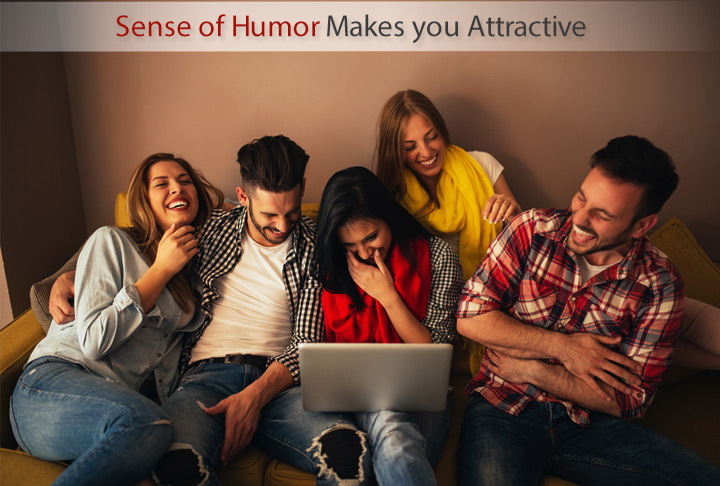 That is why it is rightly said that a sense of humor makes you attractive. Your humor shows off your kind heart and the ability to laugh at yourself. The ability to share a funny moment and joke with others makes you a popular person to be around with. Everyone wants to share a joke and laugh with their friends. That calls for interesting dates. Considered a yardstick for the level of interest and attraction, your response to the humorous quips of your date is judged. Thus, engaging in humor and flirty banter shows a high level of chemistry. Most of the intelligent, bright and witty individuals have a good sense of humor and faster repartee. Thus, if you have a sense of quick wit, you must be popular among your peers and translates as an interesting person to date. Your joke might fall flat and yet that is a risk you take which shows that you have the guts to be funny and take in the repercussions. It is important to put your date at ease to make it a great evening and that is why humor is a great icebreaker. It helps to laugh together and relaxes the date. This puts the atmosphere to talk at ease and get to know each other better.